This publication is a result of the seminar on “Small Island Developing States and the Millennium Development Goals” held 14–15 April during the FIG International Congress in Sydney, Australia 11–16 April 2010. It includes a report of the seminar and an Agenda for Action as the main outcome of the seminar. The seminar was organised to address the challenges that the Small Island Developing States (SIDS) are facing in achieving the Millennium Development Goals (MDGs) and with a special focus on the Pacific Region. In keeping with the Congress theme “Facing the Challenges – Building the Capacity”, the workshop articulated the input of land professionals in the Pacific Region and defined how mechanisms and capacity requirements can be met and can contribute to achieving the MDGs. The seminar emphasised the importance of good land governance especially in relation to climate change and natural disaster; access to land, coastal and marine resources; and secure land tenure and administration. The seminar adopted the “Sydney Agenda for Action” that aims at building the capacity of land professionals to deal with these challenges. The organisers wish to thank all who participated, contributed, supported and encouraged this seminar. Especially it is gratefully acknowledged the funding providing by Aus Aid, FAO, Commonwealth Foundation, and NZ Aid to support participation of representatives from the Pacific Region small island developing states, and from other regions throughout the world. The seminar was organised by Dr. Diane Dumashie, Chair of FIG Commission 8, Director of Dumashie Ltd, UK with a lead team consisting of Dr. Mele Rakai, President of PILPA and CASLE Pacific, University of South Pacific, Fiji, Mr. Tony Burns, Managing Director and Kate Dalrymple, Land Equity International Pty Ltd, Wolongong, Australia; Dr. David Mitchell, Royal Melbourne Institute of Technology, Australia, and Mr. Bill Robertson, Director of Bill Robertson Associates, New Zealand. FIG would like to thank the members of the lead team for all their great efforts in organising this seminar and also drafting the “Sydney Agenda for Action” for consideration and adoption by the seminar. Finally, we wish to convey our sincere gratitude and thanks to all the delegates who travelled from all parts of the world to attend this conference and whose active and enthusiastic participation ensured the success of this seminar. 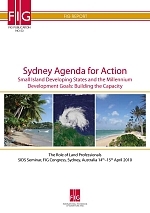 The Sydney Agenda for Action will hopefully serve as a guiding document for the land professionals in SIDS, specifically in the Pacific Region in building the capacity to meet the challenges of the future. FIG is committed to support this process. The challenges of the new millennium are well rehearsed and clearly stated. The eight Millennium Development Goals (MDGs) form a blueprint agreed by all world’s countries and the world’s leading institutions. The first seven goals are mutually reinforcing and directed at reducing poverty in all it forms. The last goal – global partnership for development – is about the means to achieve the first seven. The MDGs represent a wider concept or a vision for the future, where proper land governance is central and vital and where the contribution of land professionals is fundamental. The world is also facing global issues of rapid urbanisation, climate change, natural disasters and environmental degradation. These issues all relate to governance and management of land. Measures for dealing with these global issues must be integrated into strategies for poverty reduction to ensure sustainable development and to meet the MDGs. Consequently, the land governance perspective and the role of the land professionals need high-level political support and recognition. 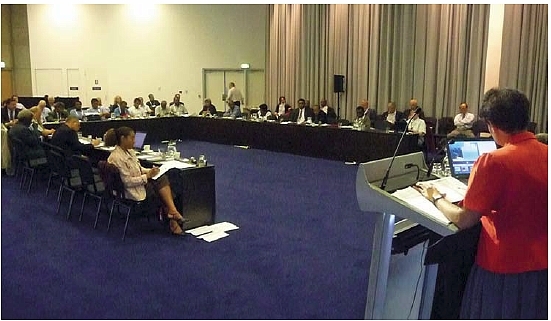 FIG adopted the theme “Building the Capacity” for the current term of office 2007–2010. This relates to land professionals “flying high” by facing the global agenda in terms of contributing to meeting the Millennium Development Goals. It also relates to land professionals “keeping the feet on the ground” by contributing to building the necessary capacity for dealing with professional, organisational and technology development at national and local levels. These aims are also reflected in the theme of the FIG Congress in Sydney in April 2010: “Facing the Challenges – Building the Capacity”. Specifically, the seminar on Small Island Developing States aims to contribute to building the capacity for land professionals and their national organisations and institutions to face the challenges of meeting the MDGs. 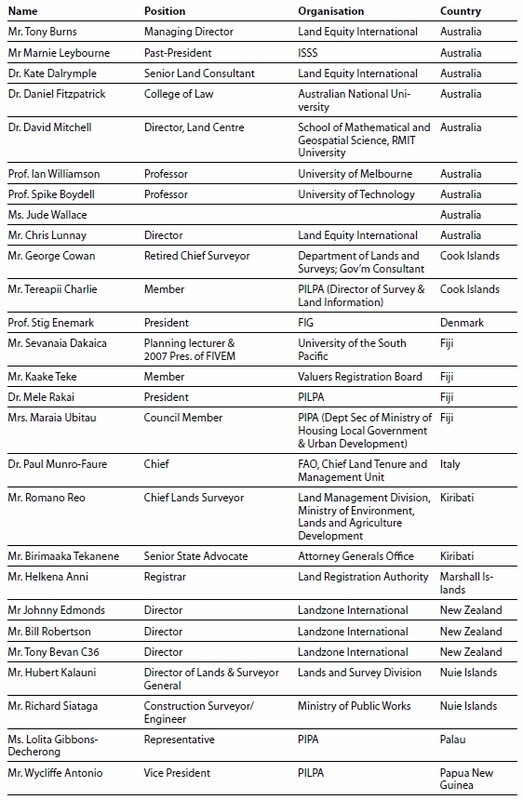 FIG is committed to support this process of resilience and sustainable development, especially through partnerships with the UN agencies and strategic alliances with the Pacific Islands Land Professionals Association (PILPA) and other organisations such as CASLE, SSSI and NZIS. This will require a strong and deep commitment to establishing a healthy land professionals´ network in the region. Setting the scene for professional capacity building by identifying the specific gaps in capacity in the region. Discussing ways in which land practitioners could contribute towards closing the gaps and thus assist with the achievement of the MDGs. Developing the relationship between climate change, community resilience and land tenure. Discussing the input and contribution of land professionals in the preparedness, mitigation, emergency response, recovery and rehabilitation stages of Disaster Risk Management. Discussing the lack of clearly defined real property rights as a major cause of dispute and resultant instability for SIDS. Exploring the topic of land governance as it applies to small island states with a prevalence of customary tenure. Discussing the land sector as particularly susceptible to corruption and rent seeking. Developing strategies and activities for building the professional capacity of land professionals in the region. Identifying the roles that land professionals can play towards achieving the MDGs in the region. The selected themes identified the relationships between climate change, community resilience, land tenure and the pathway to sustainable development of land and natural resources, ensuring an equitable approach to economic development to avoid land and resource conflicts. The themes are described in more detail in section 4 below. The seminar programme is available in the appendix in section 6. All presentations at the seminar are available at the FIG website: http://www.fig.net/pub/fig2010/techprog.htm. Land professionals and practitioners have strong roles to play in developing land policies, improving land tenure security, managing sustainable use of land, and resolving conflicts over land and mapping vulnerability. To achieve this they will need to fully understand land issues at the community level and be able to communicate these at the political and decision-making levels. Land professional should adopt the role of change agents and rise to its challenges. Land is the root of change and land professionals need to direct change towards economic, social, and environmental sustainability and good governance. Dialogue is not delivery. Therefore, the seminar aimed to produced an agenda for action on building the capacity of land professionals in the region. 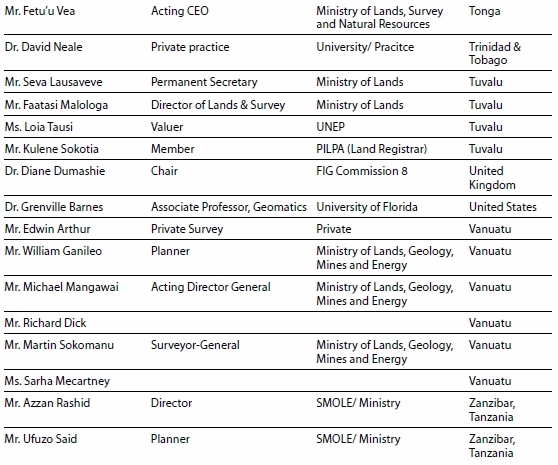 This includes some general guidance and professional ethics; guidelines on developing vehicles for building land professional capacity; guidelines on building roles and responsibilities for land professionals; and institutional responsibility for driving an agenda for SIDS specifically in the Pacific Region. The Agenda for Action is outlined in section 3 below. Although the Agenda for Action is developed for the Pacific Region it has direct relevant for SIDS across the globe. Effective and democratised land governance is at the heart of delivering the global vision of our future laid out in the MDGs. The implementation of the MDGs is however jeopardised by new challenges, especially climate change, natural disasters and environmental degradation. Small island developing states, such as in the Pacific Region, face challenges posed by size and geography that limit possibilities for economic diversification and leave them highly vulnerable to environmental risks. Land professionals in these islands have vital roles to play and to promote engagement from all sectors of society. A strong and deep commitment to establishing a healthy land professionals´ network with sufficient capacity to face the challenges and manage the people to land relationship is required. The seminar has contributed directly and actively to this process by moving the agenda forward for land professionals in SIDS. 5.4 Strategic Alliances – work to build partnerships forums to progress PILPA action plans with FIG, CASLE, and regional organizations SSSI, NZIS. 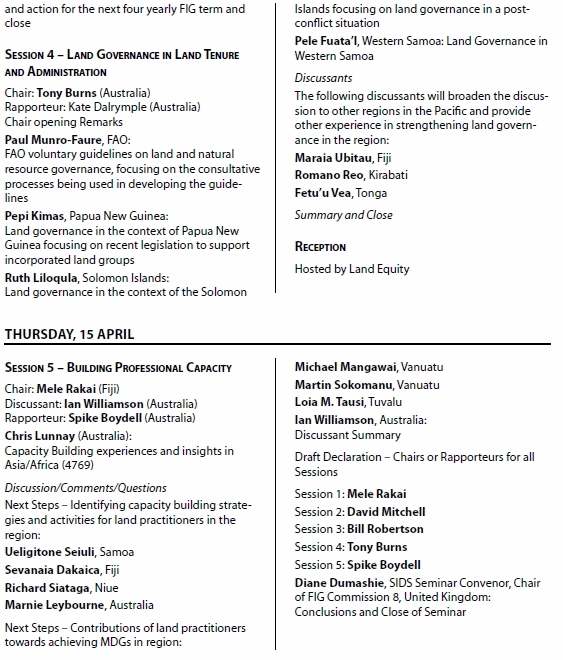 The Pacific Region represented in this seminar consists of many small countries. 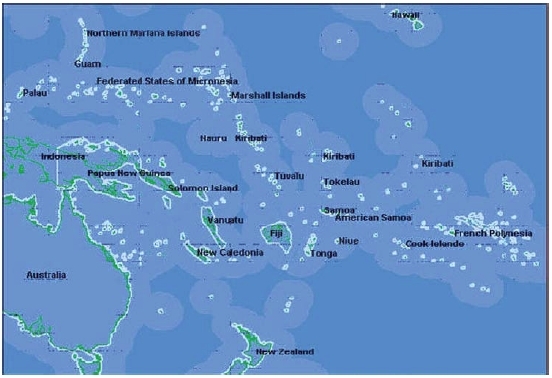 Nevertheless the total population in the region is 10 million which means that lots of people are affected by inadequate land administration systems across the region, Because of the small size of most individual Pacific Island States and the widely spread and isolated nature of the geography, the challenges for land administration in the Pacific are much more extreme than for larger developing states. Therefore there is a need for small scale urgent and effective resolution of a range of common land administration problems. Fully integrated sustainable development is a particularly important concern for small island developing states, which are among the most vulnerable countries in the world. Ocean and coastal zones form the basis for well-being and development in SIDS, so the health of these environments is critical. 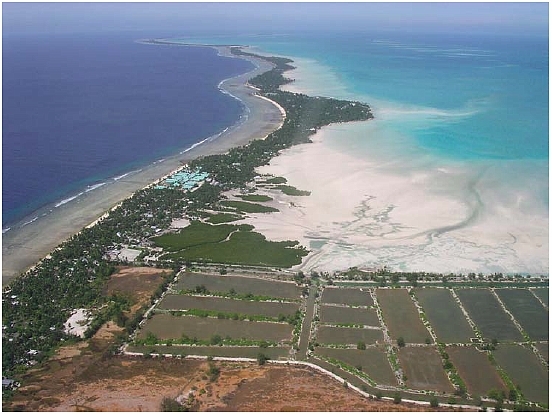 Limited land mass in SIDS creates sharply competing demands and development pressures on natural ecosystems driven by economic activities and needs for shelter, water and fuel. Coastal areas tend to be densely populated and may be low-lying, making SIDS especially vulnerable to rising sea levels, climate change and climate variability. Relationships between different sectors of the economy are very close so that poor land management affects everybody. Because of their size, SIDS are unable to capture economies of scale in their domestic markets, or in their political, managerial and technical capacities. These are characterised by open economies in which international trade is more significant than it is in larger states. They tend to rely on a limited number of external markets and a narrower range of commodities. Remoteness implies higher costs for energy, transportation and communications, while extreme weather events can sometimes destroy a country’s gross domestic product overnight. The Pacific Islands Region covers a very wide expanse of the world’s surface. Today’s is the first generation with the resources and technology to tackle poverty on a global scale and to free the entire human race from want. The MDGs are a powerful concept towards development, security and human rights for all. Surveyors and land professionals play a key role in this regard in terms of providing some of the fundamental preconditions for development. These preconditions are also embedded in the Millennium Declaration and spelled out in the targets and indicators for achieving the MDGs. In April 1994 a global conference was held in Barbados to consider how small island States could face up to their special challenges. “The Global Conference on the Sustainable Development of Small Island Developing States” determined that sustainable development was the logical answer, and adopted the “Barbados Programme of Action for the Sustainable Development of Small Island Developing States” to help bring it about. The MDGs mention SIDS direction in Goal 8 target 14 stating that the special needs of small island developing states should be addressed. This will be continuously measured as described in MDG indicator 35 that focuses on the proportion of Official Development Assistance (ODA) for the environment in SIDS. The MDGs are globally accepted benchmarks of broader progress, embraced by donors, developing countries, civil society and major development institutions alike. There is a shared vision of development. These goals can be met by 2015 – but only if all involved break with business as usual, eradicate corruption, and dramatically accelerate and scale-up action now (stated by UN 2005). In January 2005, a high-level UN meeting was convened in Mauritius to review the implementation of and refine the 1994 Barbados Programme of Action (BPoA) for the Sustainable Development of SIDS. The principal negotiated outputs of the meeting are a strategy document and a political declaration. The Mauritius Strategy builds on and reassesses the original BPoA areas. It also highlights several new priorities and emerging issues now considered important dimensions of sustainable development in SIDS. The twenty chapters of the Mauritius Strategy call for action in many fields related to UNESCO’s concerns, programmes and priorities including climate change (1), natural disasters (2), coastal and marine resources (4), and land resources (6). Ultimately, the message is that the MDGs address some of the most fundamental issues of our time. Many SIDS face challenges in terms of multiple impacts of climate change, energy and waste; unprecedented growth in urbanisation; and shortage of financial and technological resources or support. The scale and speed of these changes are already undermining progress towards the MDGs. Therefore, SIDS demand special attention due to their vulnerability, and community action is particularly needed to achieve a resilient policy and capacity approach. The Pacific Islands Forum Secretariat (PIFS) cautioned in their 2008 Forum Communiqué, that the Pacific Region has fallen behind in achieving the Millennium Development Goals (MDGs) and is not on track to achieve them by 2015. 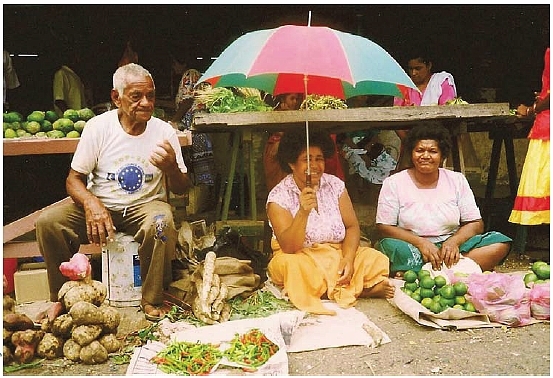 This was supported by the Lowy Report to the PIFS in August 2009, which concluded that the Pacific region needs better targeted aid, investment in infrastructure in rural areas, and more efforts to support and enable the private sector. The seminar was built around three global themes: Climate Change and Natural Disasters; Access to Land and Resources; and Good Land Governance; with an important and underlying theme of Building the Capacity. The selected themes identified the relationships between climate change, community resilience and land tenure and the pathway to sustainable development of land and natural resources, to ensure an equitable approach to economic development and avoid land and resource conflicts. Thus the themes in total reflect the Mauritius strategy as well as the MDGs. The Climate Change and Natural Disasters theme was designed to articulate the input and contribution of land professionals in the preparedness, mitigation, emergency response, recovery and rehabilitation stages of Disaster Risk Management (DRM). This contribution encompasses surveying, land administration, valuation, land use planning, and spatial information management. Land issues need to be considered in each stage of the DRM process. There is evidence of an increase in the frequency of natural disasters in the last few decades. According to the Fourth Assessment Report of the International Panel on Climate Change (IPCC 2007) climate change is very likely to lead to increased frequencies and intensities of some extreme weather events such as heat waves, tropical cyclones, floods and drought. SIDS are particularly vulnerable to natural disasters, and the impacts of climate change. 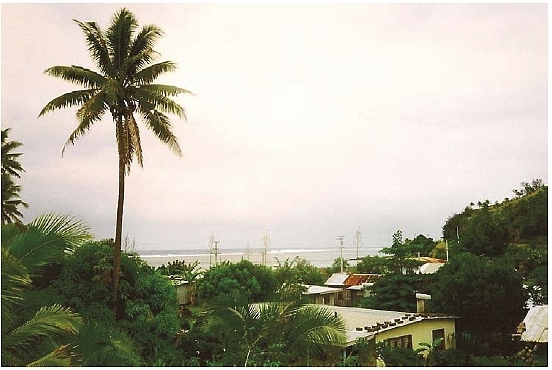 The tsunami that hit Samoa and other Pacific Island Countries in September 2009 provided graphic evidence of the vulnerability of coastal communities to the increasing frequency and severity of natural disasters. SIDS also have less capacity to respond to natural disasters, rebuild, and undertake adaptation and mitigation measures to reduce vulnerability to future hazards. The most vulnerable are more likely to live on disaster-prone land, and are at greatest risk of displacement and loss of livelihood assets in the event of a disaster. The Pacific Island countries have a high percentage of customary tenure and this presents unique challenges for DRM. Rapid urbanisation, combined with the effects of climate change, is placing unprecedented pressure on land in SIDS. This is mostly experienced in vulnerable coastal communities, and urban and peri-urban informal settlements. Many of these are governed by customary tenure and are outside the formal land tenure systems. Tenure security is related to poor capacity for resilience – the majority of the people most vulnerable to natural disasters do not have formal title to land. In many cases they have only informal tenure rights and are vulnerable to eviction after a disaster. Informal settlements are often located in coastal areas vulnerable to cyclones or storms, on steep slopes vulnerable to landslides, or along flood plains. Natural disasters are best understood not merely as the outcome of climatic, biological, or geological hazards, but as a coupling of natural hazards with human vulnerability. Disasters remove the means of generating an income (or livelihood) and destroy any savings and assets. The Access to Land, Coastal and Marine Resources theme aimed to address the issue of access to these resources in SIDS to ensure appropriate social and economic development of resources in the immediate future. 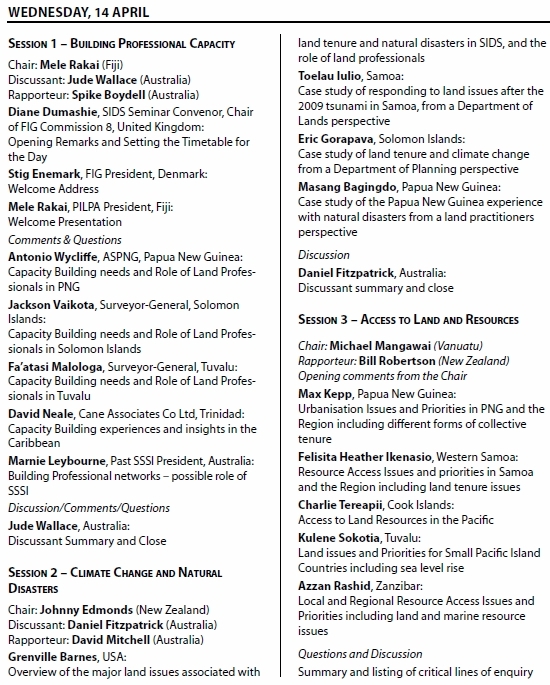 The theme also explored institutional impediments to land and resource access in SIDS including the issues of gender and intergenerational equity, and the application of land trusts, with a view to proposing workable leasehold solutions that avoid creation of long-term perpetual lease structures. The objective was to identify the lines of enquiry and the action steps that should form a local and international agenda for land professionals to greatly improve access to resources by the citizens of SIDS. Common issues identified are unplanned rapid urbanization, inadequate land administration systems for customary and other land, inadequate lease terms and conditions of customary land, un-surveyed lands, difficulty in searching land titles because of manual land registration systems, delays in registration or customary land declarations, lack of direct public access for all land information currently stored manually, and so on. The urgency for SIDS to develop new and improved systems and methods is even greater than those in other developing countries as SIDS are the more vulnerable and face more extreme challenges. The ready and efficient access to land and maritime resources for the sustainable and equitable use of citizens of SIDS is crucial. Pressures on access to resources arise through increasing demands of urbanisation, sustainable food and water supply and environmental degradation. The range of pressing issues bearing on the sustainable resource use of SIDS and their resolution will require cooperative efforts and programmes at national, regional and international levels. Access to land and marine resources is challenged by a lack of clearly defined real property rights, which in turn causes disputes and resultant instability for SIDS. This situation is compounded when viewed from outside by those who are familiar with the Western approach to land use and ownership. In the South Pacific, for example, some 83–97% of land remains vested in the stewardship of the indigenous guardians who retain the superior interest in and control of the land. It is generally accepted that this ‘superior’ interest in land – which identifies who can determine its primary uses – should not be alienated, but rather retained for the sake of intergenerational equity. To address the differences between Western and indigenous views on land ownership and control, Pacific Island governments should strive for land reform that encourages leasehold solutions that are sensitive to customary ownership. These must strike a balance between communal and individualised property rights that is agreeable to their citizens. Moreover, institutional changes from lenders and financiers are needed to accept Pacific models of access to land and resources as workable tenures. Land professionals have strong roles to play in developing land policy, improving land tenure security, resolving conflicts over land and mapping vulnerability. To achieve this they will need to fully understand land issues at the community level and be able to communicate these issues at the political and decision-making levels. Land professionals have the capability, the international linkages and the opportunity to both lead and contribute to the sustainable use of resources in their countries. The Good Governance in Land Tenure and Administration theme was focused on land governance as it applies to small island states with a prevalence of customary tenure and a land sector being particularly susceptible to corruption and rent seeking. The small island states in the Pacific, typically grouped into three regions: Melanesia, Micronesia and Polynesia cover a very wide expanse of the world’s surface. Only small percentages of the region’s land resources have been alienated to the state and most land operates under a range of customary land tenure and land use systems. Despite their formal recognition the customary tenure systems face increasing pressures from actors and institutions both internal and external to the customary groups. The prevalence and importance of customary tenure in the Pacific adds a level of complexity to any consideration of land governance. Over time the strong links between rights and responsibilities have eroded and patterns of beliefs, values and behaviours have become less integrated and more diverse. The expectation for continuing or on-going rights by individuals and families that have migrated has added complexity in many countries. Women and the younger generation are disadvantaged in access to land in some countries. Land tenure problems have been a source of conflict and are identified as a key obstacle to development in the region. The land sector is particularly susceptible to corruption and rent seeking. Land is an enormously valuable asset, typically accounting for 30–50% of national wealth in developing countries. The value of land thus creates a significant opportunity for corruption on the part of those with the legal authority to assign, revoke, or restrict rights to it. Land scarcity and demand in both urban and rural areas also increase the pressure on good governance of land administration and management systems. Population growth and urbanization drive up land value which affects housing and property and makes implementation of planning and zoning regulations more difficult. Rural areas experience increasing demands for escalating land values of new land uses, such as bio-fuel agriculture or forest reserves for carbon offsetting. Development practitioners of all persuasions recognize the importance of governance and the rule of law as essential preconditions for economic and social development. Given the complexity of land issues virtually everywhere and the fact that institutional arrangements are highly country specific systematic guidance is needed to diagnose and benchmark land governance and to contribute to improving the situation over time. Significant challenges face Pacific Island governments as they look to optimise economic development of the wider community whilst maintaining safeguards and traditions of customary tenure that are embedded in the social fabric of nations. Significant capacity building is required in order for land professionals to adequately fulfil their important mandates. A third key challenge for professionals is to earn the trust of both policy makers and the community. The underlying Building Professional Capacity theme with two sessions and a wrap up discussion was devoted to building professional capacity to enable the professionals to move forward. A key focus is on the interaction between the public, private and educational sectors (such as government, professional organisations and educational institutions) addressing what possible partnerships can be created to face the challenges of the future. Small Island developing states have unique problems such as the interrelations between land and marine environments and customary tenure highlighted by the chosen global themes, but their key issues are people, the relationship between them, and the institutions governing their activities, so ultimately the professional’s role is within the societal framework. protect and sustainably manage the environment, notably by taking steps to increase energy efficiency, promote waste management, improve freshwater resources management, and encourage sustainable use of biodiversity and natural resources. Relevant UN agencies, including the UN Conference on Trade and Development (UNCTAD), the UN Development Programme (UNDP) and the UN Environment Programme (UNEP), should continue to provide support to small states, particularly SIDS, towards the promotion of sustainable development in general and resilience building in particular. Understand the underlying land tenure and land use arrangements. Capture and record the nature of the relationships that different peoples have with their customary lands regarding their sense of identity, their ancestral obligations and rights of stewardship and the key relationships between groups of people. Map vulnerability and resilience to assist with preparedness and mitigation, and manage situations after a disaster strikes. Assign values to the level of vulnerability or resilience to allow for decisions on priority areas for mitigation and adaptation measures. Provide innovative options for improving tenure security incrementally along a ladder of rights for those with the most insecure tenure. Provide information on factors contributing to vulnerability such as the distribution of land, land tenure status, existing livelihoods, and the location of infrastructure. Communicate information effectively relating to the tenure security of customary lands to assist customary landowners to make informed decisions. Develop land policies based on inclusive and consultative processes that make provisions for those at highest risk of a natural disaster, and those with poor tenure security. Analyze land governance at all levels and implement measures to improve governance in the land sector. Contribute to the development of effective land dispute resolution mechanisms for both customary and formal land tenures. Land professional should adopt the role of change agents and rise to its challenges. Land is the root of change and land professionals need to provide the leadership that delivers economic, social, and environmental sustainability and good governance. Developing countries – such a SIDS – need to ensure that their land is effectively and appropriately managed; that management can support economic growth of the country; and that people´s interests are adequately protected. This requires governments to establish effectively operating land administration systems. Building the capacity is the key issue in building or reforming land administration systems. Capacity building measures must be seen in a wider context of developing and maintaining institutional infrastructures in a sustainable way. Only then can a capacity building concept guide assessment of capacity needs and identify adequate responses at societal, organisational and individual levels. 1. Capacity assessment that is a structured and analytical process whereby the various dimensions of capacity are assessed and the capacity needs identified in relation to undertaking the relevant tasks within the system. 2. Capacity development is about developing the capacity and skills for meeting the capacity needs of performing the core functions. The measures of capacity development may be in terms of education and training or it may be in relation to institutional and organisational restructuring. The societal level, which includes the political objectives, land development policies and policy instruments, and the legal framework. The organisational level, which includes the institutional infrastructures, good governance, spatial data infrastructures, ITC infrastructures, and professional institutions. The individual level, which includes human resources and skills through education and training and continuing professional development (CPD) activities. Adoption of a comprehensive land policy is crucial, since this will drive the legislative reform which in turn results in the institutional reform and finally implementation with all its technical and human resource requirements. However, capacity building is not a linear process. Whatever the entry point and the issue in focus, zooming in or out to incorporate the conditions and consequences at upper or lower levels is frequently necessary. Capacity building should be seen as a comprehensive methodology aimed at providing sustainable outcomes through assessing and addressing a wide range of relevant issues and their interrelationships. Recognising that developing countries struggle to catch-up in professional skilling, SIDS are especially vulnerable. Often land professionals need to redefine local, traditional tenures in response to social and economic changes, to set land policy, and to take the initiative where indigenous land rights need stabilising in the face of emerging agricultural and tourism demands. (Nicholas Nigroponte as presented by Sevania Dakaica, Fiji). Increase knowledge and expertise in disaster risk management. These are cross cutting issues and need to be embedded at each of the three capacity levels: societal, organisational and individual. Given the dearth of professional people all SIDS need land policy professionals who are multi disciplinary, and capable of taking the initiative to deal with issues of land access. Above all land professionals must build their personal capacity to provide leadership and simultaneously support their professional leaders. The Pacific region is currently undergoing much needed land reforms, to allow it to respond to pressures caused by a global market economy, by new technologies, by rapid population growth, by internal migration and urbanization, and by environmental and social change, including climate change. Reform of land policy is a complex process that cross-cuts security of tenure in land, efficiency of land markets and effective control of land use. These components rely on some form of land administration infrastructure that identifies the complex range of rights, restrictions and responsibilities in land so they can be appropriately surveyed, mapped and managed as basis for implementing land policy. A broad range of capacity building and human resource development (HRD) measures need to be considered and established. 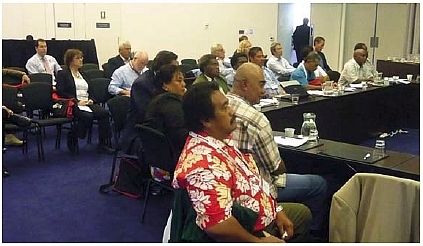 The inaugural meeting of the Pacific Islands Land Professionals Association (PILPA) in 2008 recognised the scarcity of land administration professionals and practitioners in most Pacific Island countries and the need for urgent responses. The seminar therefore identified capacity gaps among small island states through discussions on: professional capacity in land administration; response and risk management of climate change and natural disasters; impediments to access of land and resources; and considerations of good land governance and administration. These issues were carefully considered from the perspective of how they can be addressed by land professionals of small island states. The outcome is presented in the Agenda for Action in section 3 above. The aim is to emphasise the important role of land governance in addressing the MDGs but also articulating the input of land professionals and their contribution that promotes engagement from all sectors of society. This will require a strong and deep commitment to establishing a healthy land professionals´ network. There are a rage of problems to be faced by in the Pacific Region such as lack of land professionals, lack or quality professional education and training of land professionals, lack of engagement between governments and professional associations, and lack of adequate resources for education and capacity building. The Pacific Island Land Professionals Association (PILPA) was established 2008 at the FAO/UPS Good Governance in Land Seminar held July 2008 in Suva, Fiji to address these problems and more, generally, to extend understanding of the importance of professionals who can deliver land management skills in support of the MDGs. With a Pacific SIDS perspective highlighted the National Land Development Taskforce report on capacity needs specifically that the basic professional skills in the region are adequate but specialist skills and research and development skills are lacking. To overcome the reliance on professional foreign consultancies strong professional bodies need to be established and the provision of continuing professional development forums. The two broad professional challenges are technical and articulating customary system. First, private practice provides technical survey and valuation skills to relieve ministry work load; but policy capacity is lacking. Second a Land reform group is seeking to transform the local customary system to mobilize land for development; but this needs to be achieved in a cost effective system. Overseas and Intra island exchange educational programs are needed, coupled with in-service training and as necessary selective engagement of foreign experts should be considered. Public government departments are often poorly resourced on Pacific Islands such as Tuvalu. The problems are compounded by limited training for professional assistants. Survey regulations and land management standards do not exist so survey standards are often being adopted ad-hoc. Building capacity needs to include formalising professional accreditation from neighbouring countries and providing local training programs. Providing a snapshot of capacity building experiences from the Caribbean SIDS region (24 States), and emphasising that many of the same capacity issues arise such as politics, training, and convincing the public. A Caribbean ongoing positive solution is the collaboration and cooperation of an active university that operates across 11 countries. This has the benefit of pooling resources and talent. The Surveying and Spatial Science institute (SSSi) was formed 2009 as a merger between the Institute of Surveyors Australia and Spatial Science Institute. SSI is keen to explore ways to support SIDS through engagement as a professional group, addressing training needs, and enhancing professional opportunities and standards in the Pacific. The findings of research on land tenure issues following hurricane Ivan in Grenada, and hurricane Mitch in Honduras, focused on pro-poor land governance issues. Donor agency insistence that that all recipients of aid for new houses hold a valid land title, does not account for the majority of the most vulnerable people not holding title. Short and long-term actions were suggested to improve resilience. Among the short-term measures were diversification of livelihoods, improving tenure security along a “ladder of rights”, and resettlement away from the most vulnerable areas. Particular interest and action to land practitioners in the recovery after the Samoa 2009 tsunami was the damage to the Samoa Survey Control Network. The Department of Lands role was to organise resettlement of people away from vulnerable coastal lands to higher land. This required relocation of infrastructure such as water supply to the newly developed areas. Before this could occur the geodetic network needed to be upgraded and extended into the new areas to meet the demand of land development. The 2007 Earthquake in the Solomon Islands led to the resettlement of large numbers of people from coastal lands to state land and customary lands. The result is government eviction of people from state owned lands that are earmarked for national projects. Indeed active involvement of rural communities in recovery and reconstruction can be realized through a proper village planning process. Long-term improvements to tenure security can be achieved by demarcating relocation sites and granting fixed-term titles to the displaced families. PNG is particularly vulnerable to all types of natural disasters PNG survey practitioners operate specifically in mapping and assessing climate change affected areas (hot spots). The legislative structure has come under pressure and subsequent review, but significant difficulties in surveying the customary lands (approximately 97%) exist. Capacity building initiatives include the development of postgraduate diploma, and a review of surveying legislation, and education and training based on lessons from previous disasters. PNG has the largest urban population in the Pacific Region with 900,000 people living in urban areas with a current growth rate of 13%. There several examples of unsatisfactory land administration. PNG via its National Land Program is leading the way in land reform in the Pacific region via a suite of institutional, policy, and legislative changes, with a focus on urban areas. The Samoan registry system is based on deeds and was moved onto the Torrens system in 2009. Tenure categories are 81% customary land (81%), freehold (4%), communal or public land (15%). A review of the alienation of customary Lands Act 1965 is under way. There is currently a review of alienation of the Customary Land Act and a 2008 act amendment enables the registration customary lands through the customary courts. The country consists of 15 small islands, with a population of 19,500. They use the NZ Survey Act and there is no land subdivision town planning legislation. Absentee land ownership is high as 80% of Cook Islands live overseas. There is an urgent need to fully brief politicians on land administration weaknesses and the reforms needed. Tuvalu is an independent sovereign state of 9 tiny islands in a sovereign state with a population of 11,000 people. Land ownership remains with indigenous people, and land is seen as the not only mother but also a commodity that is very precious and therefore requires careful management for the future. Important to convince politicians to adapt and adopt regional and international concepts of land management systems. 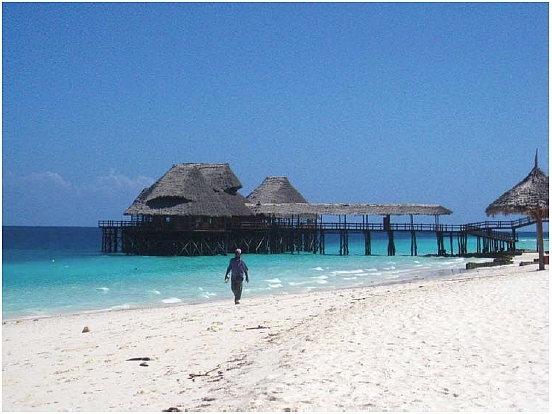 Zanzibar has a population of 1 million with 40million population in the whole of Tanzania. Major land issues in Zanzibar and the wider region are security of tenure for land holders of whom 80% live in rural areas and depend on subsistence agriculture. Parcels of land are owned in community system. There is a need for clear policies and legislation for land transfer, acquisition, humanized and community involvement. Development of the FAO Voluntary Guidelines is an ongoing process in the context of the Pacific. A cross section of local partners, including private, government and academia are invited to discuss topics over 2.5 days. It is planned that sessions will be held in the Caribbean in September 2010 and the Pacific Sub-office are to meet again in July 2010. The voluntary guidelines are an intensive and challenging process that is hoped to be of benefit to the people that are invited and countries that will adopt the guidelines. Land being a central role in the everyday lives of Papua New Guineans is seeing a change. Major developments are occurring now to ensure that customary land holders have the opportunity to benefit from potential development returns from their land. To date, most economic activities were conducted on state land. The government have set a 2050 Vision for easier access to customary land. There is a need to re-establish professionalism in the land sector to eliminate corruption as key strategies in building community trust. There is ethnic tension caused by customary and crown lands. Good governance in land affects national well being and too many land disputes occur in Solomon Islands. Capacity building must build independence rather than dependence through mentoring. The large majority of Fijian land is under native tenure (88%), half of this which is under Native Reserve, while the remained is held under freehold (8%) and State land (4%). Numerous legislative acts help to provide a strong legal framework for the management of land covering all legal tenures. 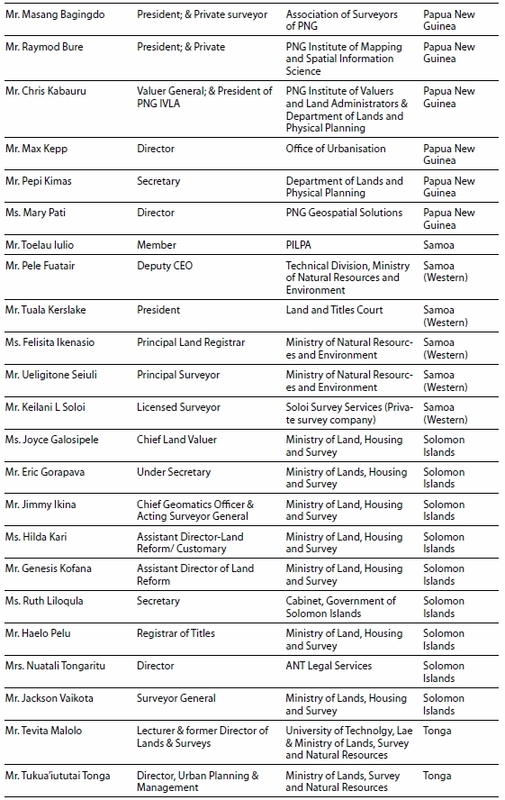 There are many strengths within the current Fiji land administration system, however there are also some weaknesses, including the problem of ensuring that the development decisions of the Native Land Trust Board provide optimal returns to customary land holders. The Kiribati Islands home to 95,000 people with almost half of the population living in the Capital on the main island of Gilbert. 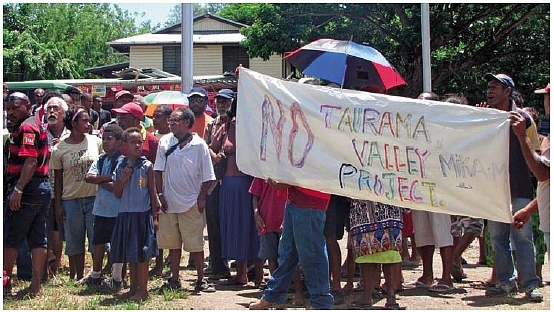 Only 37% of land is under customary land tenure on the main Gilbert Island while the remainder is all State owned. Squatters operate on government lease land due to urban drift and population growth. Landowners pressure government for surrender of undeveloped portion of leased lands. of data to the Torrens system in a recent upgrading land administration and cadastre project. This eliminated the Deeds system. However natural disasters have since broken the server and the backup and a new solution is required to retrieve the data. Effective capacity building is mostly through hands on training, on-the-job training and study tours. Ongoing communication via email and internet are useful for support after assistance has finished. The strengths in land governance are historical. All principles of MDGs were in Tongan Constitution of 4 Nov 1875 and related land acts with rights to any male of 16 and over land, access and development. Current governance weaknesses include: Shortage of land professionals, including cartographers; Some of the work is still done manually, however the World Bank have computerised the registry; Financial constraints prevent further reform. Developing countries need to be in a position to ensure that their land is: effectively and appropriately managed; can support the economic growth of the country; and that people’s interests in their land is provided with an acceptable level of protection. This requires governments to have in place effectively operating land administration systems. Through a few case studies it is possible to gain an appreciation of where capacity building has failed or conversely been successful. This relates to studies of capacity building activities in Lao PDR (Asia), Lesotho (Africa) and the Pacific Nations. SIDS professionals need to overcome the situation whereby they have to use other nations tools. Typified by the UNDP land administration projects which uses a Needs Assessment Tool; SIDS should be developing their on specialised land tool, and resist agencies treatment of land administration as a cross-cutting issue, merged into other sectors such as water, forests, environment, agriculture, cities, etc. The important issue for SIDS is their professional relationships with funding agencies and access to funding streams. Graduates are needed to meet capacity needs. Field practice is essential for professional recognition. Funds must be available for training and new equipment and travel. There are large numbers of land practitioners across the Pacific Island countries who are not formally trained and qualified. There are constraints to self funding studies and existing scholarships does not prioritise land management studies. Only PNG and Fiji have tertiary education institutions for land practitioners. Literature calls for multiple strategies for capacity building in the land sector; relying on new partnerships and use of distance and flexible learning. Land reform public discussion organised in Fiji was well attended by Fijians. Reinforced what was said yesterday about strong partnerships with SSSI to address capacity needs. Members of SSSI are keen to help develop capacity in home countries. Climate change will impede nation´s ability to achieve sustainable development pathways as to achieve our MDGs. Important to map vulnerabilities in precise terms as land professionals and learn how to implement good governance and to deal with corruption. Share lessons learned by neighbouring countries to enhance capacity. Ending women’s disadvantage is important. Adaptation is the way forward to achieve resilience. Monitoring and evaluating capacity needs is essential. Financial assistance is greatly needed by SIDS. Scale of challenges combine geography, plate tectonic activity, poor agricultural soils, and 90% land in customary land tenure (and practices) for use of family members. Land administration department is guided by the Planning Long Acting Short Matrix 2010–2015 (PLAS Matrix) that steers government priority action agenda framework. But a major challenge is the lack of land professionals and clear defined land policies. There is a need to amend the MDG Needs Assessment Tool (UNDP) which does not suit the Vanuatu context. Niue is a small raised coral island of 259 sq km with a population of 1,625 (2006) and governed by the Assembly of 20 elected members. The gap between domestic production and demand for goods and services is very wide and makes Niue heavily dependent on foreign aid. Challenges relate to lack of qualified staff (brain drain), lack of modern equipment, and lack of training and upgrading opportunities. Empirical lessons resulting from cyclone Heta (2004) where land data was destroyed, leading to increased need for overseas technical assistance. Stig Enemark and Matt Higgins: The Global Development Agenda, Its Relevance to the Asia Pacific Region and the Role of the International Federation of Surveyors (FIG). Combined 5th Trans Tasman Survey Conference & 2nd Queensland Spatial Industry Conference 2006 – Cairns, 18–23 September 2006. Small Islands Big Stakes, UN International Conference, Port Louis, Mauritius, 10–14 January 2005.